New extension to house new plant (heating/cooling) and new office facilities. Decommission old steam plant and install new steam generators and new ventilation to service offices and slaughter areas. 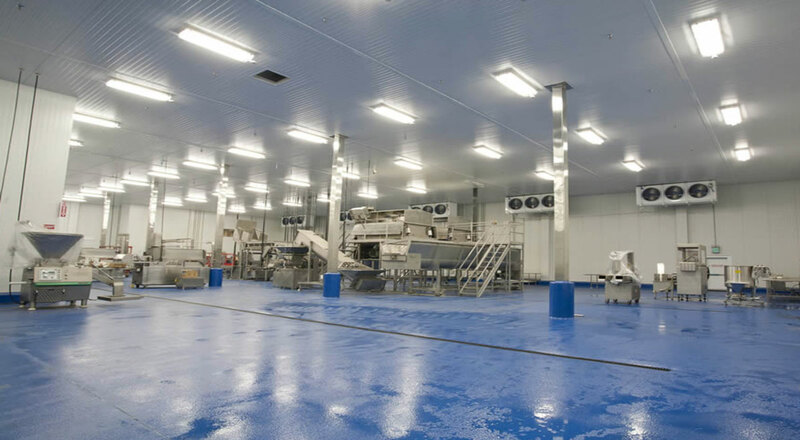 As part of a £16M investment and one of the most advanced abattoirs in the UK, this large project consisted of 2 control panels; one for air handling plant and one for heating and hot water supply control linked via Ethernet. This system was connected to the site network for web browsing and to the site PLC system for remote enabling where required. The heat reclaim system pre-heats the water feeding the hot water supply system to cope with the high volume of water used both to clean and to sterilise in the slaughter operation. The system reclaims heat from heat exchangers fitted on compressors, two evaporators on chilling plant and a pig singer. This pre heats the water to approximately 40°C+. The control of the steam valves is critical in providing a constant circuit of 65°C and one of 90°C. Due to the high pressure/high temperature steam, the PI loops had to be tuned carefully to prevent overshoot. The control panel site was reduced by utilising BACnet communications for the many fan inverters which received main power from local distribution boards which saved on install cost.